SKU: 0009. Categories: Books, Madness Series, Train Books. A compilation of stories gleaned from a lifetime of watching, chasing, photographing and riding trains. The twenty-two chapters cover the author’s lifetime affliction with “Train Madness,” the state of mind where everything in life revolves around trains: From his first memories of trains, fear of conductors, photographing trains (and destroying cameras in the process), train rides (both legitimate and not-so-legitimate), searching out obscure rail lines and locomotives, encounters with railroad employees and witnessing unusual railroad events. All of the stories are funny. Many of the stories are hard to believe (thus the reason for many of the photographs). 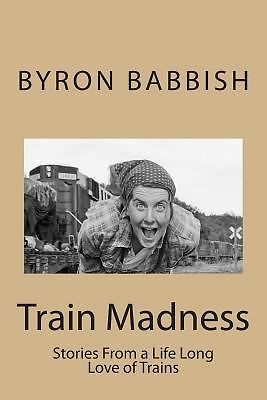 The book conveys one person’s life long love of trains that can only be described as Train Madness.